Clean fuel company ITM Power has opened a new public hydrogen refuelling station in Rainham, East London. The new site is located at the Centre of Engineering Manufacturing Excellence (CEME) and uses solar energy from a solar PV array at CEME to make renewable hydrogen on-site. The site is situated just off the A13, linking London City Airport and the M25, and is now available for public and private fleets. 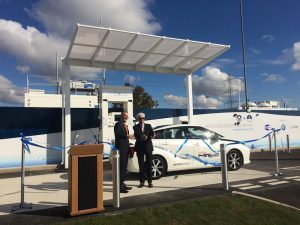 The station marks the second of three to be deployed in the UK as part of the pan European HyFive project, which was funded by the European Fuel Cell and Hydrogen Joint Undertaking (FCHJU) and the Office of Low Emission Vehicles (OLEV).